Piano Concerto In A Major, K. 414 composed by Wolfgang Amadeus Mozart (1756-1791). Edited by Christoph Wolff. For two pianos four-hands. This edition: Stapled, Urtext edition. Stapled. Classical Period. Difficulty: medium. Piano duet score (2 copies necessary for performance). Duet notation. K. 414. 48 pages. Duration 23m. 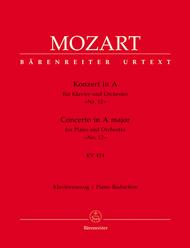 Published by Baerenreiter Verlag (BA.BA4876-90).ISBN 9790006458394. With duet notation. Classical Period. 9x12 inches.